Good morning! I've had a pretty good week and now have a house full of guests for the weekend. Hopefully of you are gearing up for a relaxing couple of days, as well. 1. Tomorrow our family is headed to the Texas State Fair where we will partake in ridiculous friend goodness like Friend Bacon Cinnamon Rolls, Fried Marshmallows, Fried Mac and Cheese, and other totally healthy options. 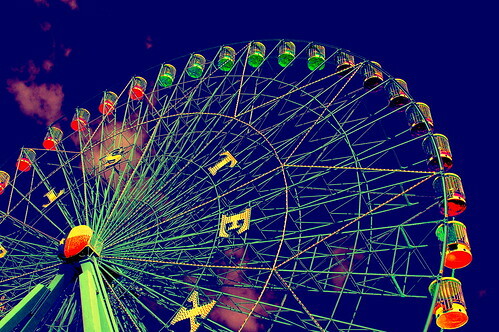 I'm excited, though I'll only be looking at the giant ferris wheel since I am scared of riding them. It's one of my strange fears that I cannot shake. Am I the only one? 2. Last week I started watching Call the Midwife, a BBC show currently running on PBS and so far I love it! It's about NHS midwives in 1950s East London, and the star Jessica Raine seems so cool and chic. She's not been cast in much yet, but I think that's about to change. 3. I love seeing outfits on Pinterest that I can recreate, but never thought to do so. Here's one that had me wondering why I've not put a gray tee under my blazer with a turquoise necklace - so chic! 4. Can we also take a moment to discuss how Gap is killing it with the Fall collection this year? I am in love with this camel leather jacket, and I especially appreciate how Eileen of A Creative Day put together this lovely collection of looks in one clean image. Check out her original post here. 5. 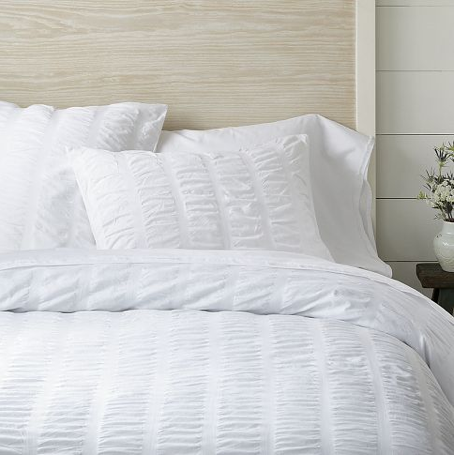 I'm in the midst of redoing our guest room (on a teeny little budget) and am looking for some white bedding to add some texture. I love this option from West Elm, but not the price. Any ideas where to find a cheaper copycat piece?